Pyramiding is a trading system that drip feeds money into the market, gradually as a trend develops. This strategy has several advantages. The two main ones are risk limitation and building on winners. We’ll look at each of these in turn. The first and most obvious reason why pyramiding is used is that it limits risk. The easiest way to appreciate this is with a simple example. Let’s suppose a non-pyramid trader thinks EUR/USD is in an uptrend. And he wants to buy EUR/USD to get in on the trend early. The last ask price was 1.1000. The maximum exposure the trader can commit is one standard lot. To enter the position he buys one standard lot at the ask price 1.1000. With this trade he’s entered at full exposure in one single hit. Now the pyramid trader seeing the same opportunity takes a different approach. Instead of entering the position in one hit, the pyramid trader will grow the position only if the EUR/USD bullish trend advances as expected. The maximum exposure will still be one standard lot, but the pyramider splits the entry into four separate orders. The pyramider enters at an average price of 1.0989 whereas the non-pyramid trader entered at 1.1000. But what happens if the trend goes the other way? Let’s suppose that instead of trending up EUR/USD starts to turn bearish after the second trade entry. Based on this new information the pyramid trader decides to abandon the trade idea and close out on a small loss. The pyramid trader closes the position at 1.0850 making a loss of $500 having only committed half of his maximum holding size. Meanwhile the regular trader, also deciding the trend is going the other way closes at the same time and at the same price. Because he entered at a higher average price, and committed all in one go, he makes a loss of $1500. That is three times that of the pyramid trader. As well as achieving a better entry price due to averaging, the pyramider had more flexibility and was able to exit before being full committed when the trend turned the other way. In the above example, the pyramid trader had more choices and therefore could be a lot more flexible in his strategy. He was able to abandon the trade idea early on when the trend went the other way. The other trader was fully committed up to his risk limit right from the start. This leads on to the second advantage of pyramiding; the ability to build on winners and drop losers. A pyramid trader accumulates the position as and when the trend moves in the direction of profits. By managing separate stops and take profits on each position, the pyramid trader can build on a winning trend and at the same time, gradually lock in and accumulate profits. Take this example in the table below of a classic pyramid trade. 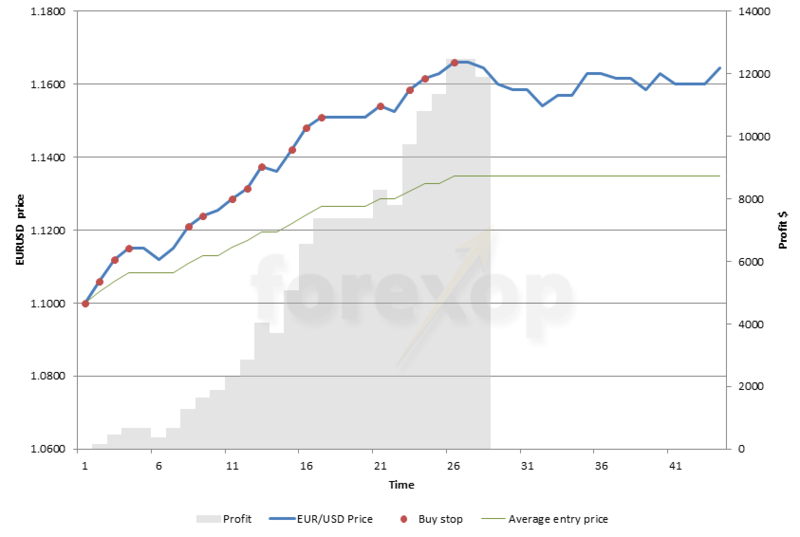 The final column on the right shows the profit lock in as EUR/USD moves higher. Notice how the profits are pyramided as the trend moves in the direction of profit. If the trend falls immediately after entering position 4, the profits on positions 1 to 3 are locked giving a profit of $588. The stop loss on position 4 is hit and that results in a loss of $125. That gives a profit on the complete holding of $463. If, after entering position 3 the trend fell immediately, there would be a loss of $88. This is made up of $25 locked in from the first position, $13 from the second, and a full loss of $125 on the third. 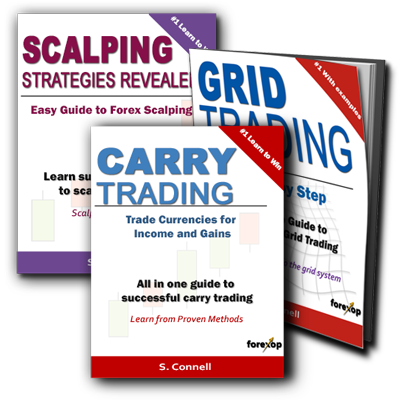 Pyramid trading has much in common with grid trading. Both systems use split orders and usually make use of pending stop and limit orders. To profit from a growing bullish trend or a potential bullish breakout a pyramid trader will deploy buy stop orders. For the other direction sell stop orders are needed to follow bearish trends or to enter on a bearish breakout. A pending buy stop order executes only if the ask price reaches or goes higher than the value set in the order. This makes it useful for situations where you want to enter a trade only if the price goes higher. If the market doesn’t reach the set price within the time limit, a buy stop will expire unfilled. 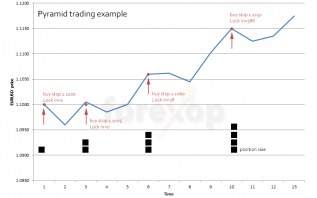 In a pyramid trading system we want to set the orders to execute one by one as the trend moves higher. Either the stop orders are placed all at once or more typically they are cascaded so that as one executes a new order is placed. See Figure 1. This system grows the position size only after profits on early trades are already locked in, thus limiting downside risks. Take the following simple example of a pyramid trade. The market outlook is bullish. To profit from this a pending buy stop order will be placed at a distance of 25 pips above the current market price. If that buy stop order executes, a new one is positioned at a distance 25 pips above that entry. This process continues until the system stop is reached. The stop loss is set at a distance 50 pips lower than the current bid price. 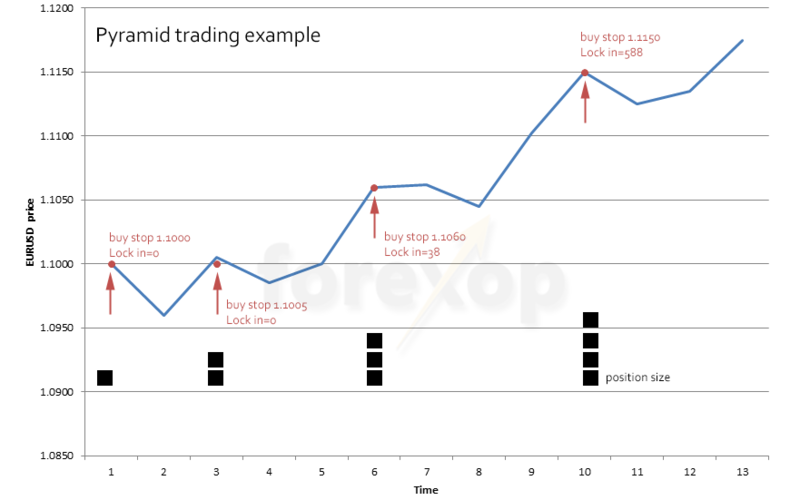 On execution of any order, the stop losses for the earlier orders are moved to the same level at 50 pips below the current price. This locks in profits on the trades that are already in profit. There are no take profits. This trade system lets the winners run. The profit on the whole system is realized when the trend falls low enough to execute the stop losses. Each order size is ¼ of a standard lot. Figure 2 is an example run, and demonstrates how a pyramid trade captures profits on a rising (or falling) trend. The blue line is price. The red dots are the buy stop orders that execute. The green line is the average entry price that’s achieved. The gray bars denote the profit/loss on the entire position. Notice here that the green line resembles a moving average. Because we’re splitting the order up and hitting the market at a range of different points, there’s a higher chance that we’ll achieve a price near to average. The more orders that are placed, the closer the entry will be to the average. This makes it far easier to exploit a trend than gambling on a single entry. With a single entry system there’s a high chance of hitting one of the extremes, either buying too high or selling too low as the price oscillates around its mean value. These settings are just by way of an example. To experiment with different trade setups use the pyramid trading spreadsheet below. There’s no such thing as a free lunch and that means that pyramiding has its disadvantages too. With pyramiding money is drip fed into the market. And while risk is lower, the profit potential is lower too because it achieves an averaged entry price. With a single entry system, you have the potential to make bigger profits, if, you time the market right. But that’s a big if because market timing is a deceptively simple thing but extremely difficult to do consistently enough to make stable profits. Pyramid trading has several advantages. Just like grid trading, well executed pyramid trading is successful when it’s used to spread risk not scale up order sizes.